In a medium bowl, whisk the eggs, milk, cottage cheese, red pepper flakes, 1/2 tsp. salt and 1/4 tsp. pepper until well blended . 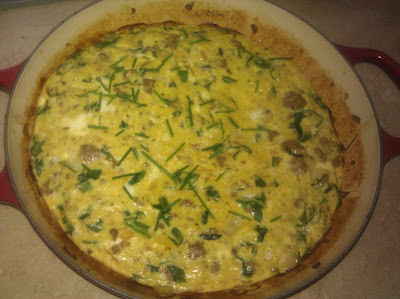 In an oven safe skillet, brown sausage over medium heat. Remove sausage and drain on paper towels. Return skillet to heat and add the olive oil. Sauté the onion for five minutes, or until translucent. Add spinach and cook until slightly wilted, about two minutes. Place skillet in the oven and bake for fifteen minutes, or until frittata is puffed and golden brown. Cool for five minutes, sprinkle with chives, slice into wedges, and serve.